The Chicago Zoological Society (CZS), which manages Brookfield Zoo, is taking the lead in the largest-ever, multi-institutional study of how physical habitat, environmental enrichment, and animal training impact the welfare of cetaceans in zoos and aquariums worldwide. This study will take place across 44 accredited facilities in seven countries where scientists will gather data regarding approximately 290 common and Indo-Pacific bottlenose dolphins, 20 beluga whales, and eight Pacific white-sided dolphins. 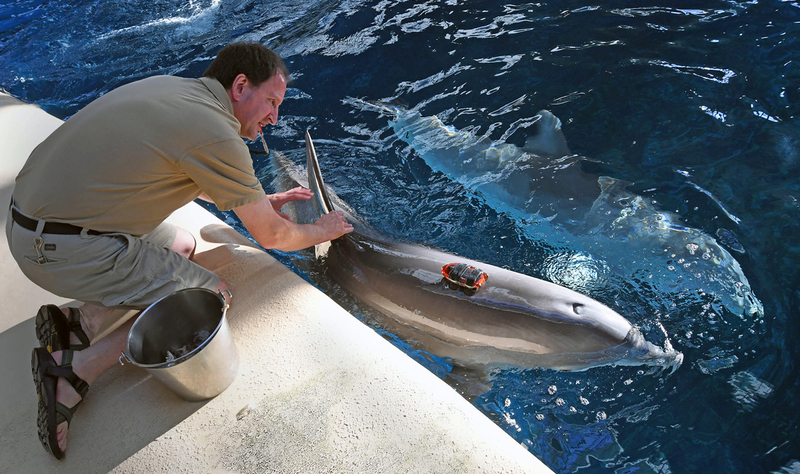 A Chicago Zoological Society animal care specialist at Brookfield Zoo secures a bio-logging device on a bottlenose dolphin. Data collected from the device will be used to measure the dolphin’s activity and movement. Researchers will attempt to quantify the welfare of dolphins in zoos and aquariums through the devices as well as observation of video taped segments and measuring hormones and other biomarkers of health and welfare. “Cetaceans currently receive high levels of care in accredited zoos and aquariums around the world, but it is important to use science to cultivate best practices and make continuous improvements,” said Lance Miller, Ph.D., senior director of animal welfare research for the Chicago Zoological Society, and one of the six principal investigators on the study. “It is wonderful to see the cetacean community coming together to help optimize the care these animals receive now and in the future.” Some of the study’s institutional partners include Georgia Aquarium, Ocean Park Hong Kong, Indianapolis Zoo, Texas State Aquarium, and Delphinus Mexico. Approximately $740,000 in funding is being provided through a National Leadership Grant from the Institute of Museum and Library Services (IMLS), with additional funding from partner facilities. 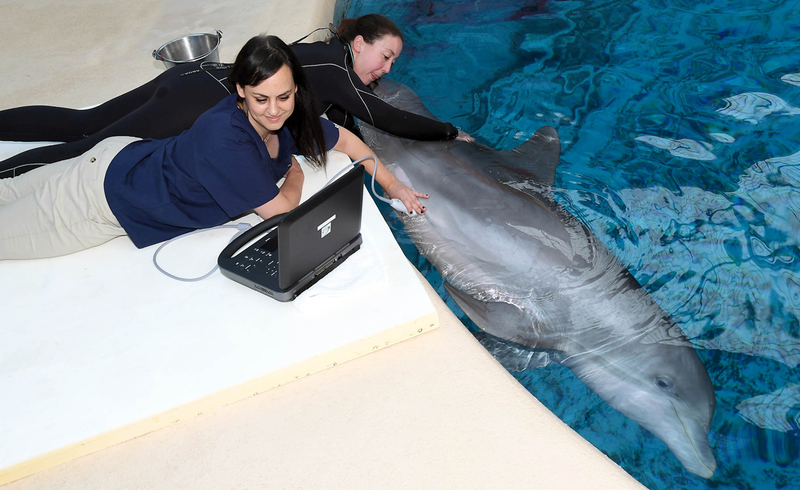 A veterinary radiologist and animal care specialist for the Chicago Zoological Society conduct a medical exam on a bottlenose dolphin at Brookfield Zoo. Medical procedures are just one component of the largest-ever, multi-institutional study being conducted to determine how physical habitat, environmental enrichment, and animal training impact the welfare of cetaceans in zoos and aquariums worldwide. - How do habitat characteristics impact environment use, energy expenditure, and swimming behavior of bottlenose dolphins? - How does environmental enrichment influence behavioral and physiological indicators of animal welfare? - How does the type and timing of animal training influence behavioral and physiological indicators of welfare? In addition to Miller, principal investigators also include Lisa Lauderdale, Ph.D., a postdoctoral fellow in the Animal Welfare Research department for the Chicago Zoological Society; Joy Mench, Ph.D., professor emeritus in the Department of Animal Science at the University of California, Davis; Jill Mellen, Ph.D., affiliate professor from Portland State University Biology Department; Michael Walsh, DVM, clinical associate professor at the University of Florida College of Veterinary Medicine; and Douglas Granger, Ph.D., professor and director of the Institute for Interdisciplinary Salivary Bioscience Research at the University of California, Irvine.